Celebrate the 80’s pop culture in all its glory with this 1000-piece puzzle. Featuring fashion and sports, celebrities and politicians, and some of the most recognizable characters of the special era called the 80's, this jigsaw puzzle makes a fantastic companion to the 50's, 60's, 70's and 90's puzzles. Be sure to collect them all! The White Mountain Puzzles – The Eighties Jigsaw Puzzle is the inspiration of James Mellett. A Pittsburgh native, James Mellet been a freelance illustrator for almost 20 years working out of his home studio. He has also been awarded and recognized for his astounding sports art. Art jigsaw puzzles are a fun and inexpensive way to enjoy beautiful works of art first hand! Jigsaw puzzles are also used to boost cognitive skills; develop hand-eye coordination, fine motor skills, problem solving, shape recognition, memory, and task completion. The White Mountain Puzzles – The Eighties includes 1000 unique interlocking pieces made of sturdy blue chipboard on recycled paper. Extra large sized pieces for easy handling. Completed puzzle dimensions: 24 x 30 inches. Every White Mountain Puzzle is proudly manufactured in America with a 100% customer satisfaction guarantee. 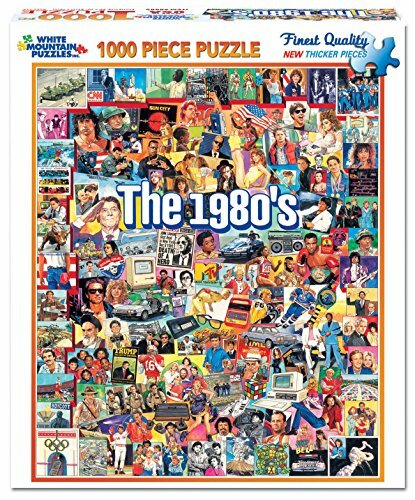 80'S POP CULTURE: Colorful collage puzzle featuring fashion and sports, celebrities, politicians, and some of the most recognizable characters of the special era called the 80's.